Very CAS! I used the coordinating dies, stamped my images, and popped them up over an oval frame that I embossed with the SU Square Lattice Textured Impressions folder. The sentiment comes from the PTI set Beautiful Butterflies. We hope you'll play along with us this week! Just link your creations to the Color Throwdown Blog HERE, and while you're there make sure you check out the rest of the amazing DT creations! Well, we had a wonderful vacation last week, and it's back to the real world this week. I am actually home schooling my daughter this year which was a HUGE decision, but the first couple of days have gone pretty smoothly:) By next year we hope to be living in a new house in a much better school district! I was frightened by these colors, and then I saw your card. You make it look easy! ;) Beautiful. GORGEOUS card, Kerri! I really loved these colors and you totally rocked them with your design! Glad you had a good vacation...always nice to go but always good to be home again! Beautiful! The colors are perfect for those roses! 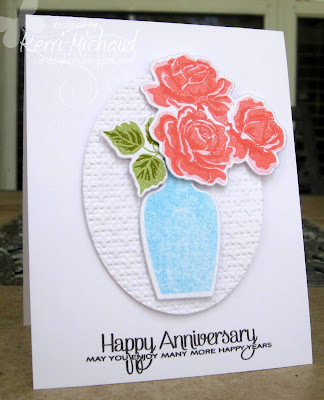 Loved the colors this week, Kerri...your roses are beautiful and I love how you added the texture in the background!!!!! 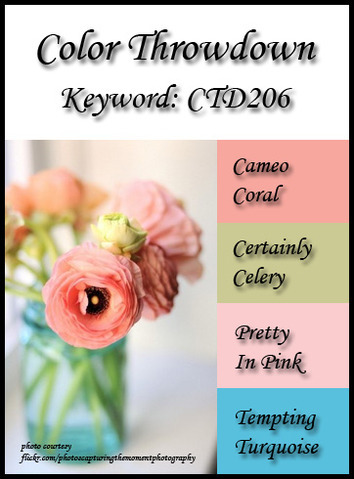 Gorgeous color choices this week, Kerri! (They match your blog background and header!) Your card is absolutely beautiful too!! This is absolutely gorgeous Kerri! I love how you created the embossed mat for this lovely vase of roses, it really makes it pop! Love it!! Love the textured oval and those flowers and vase! Wonderful! Gorgeous card to show off these pretty colors. I love the dimension on the blooms and the pretty font in that sentiment. looking forward to see your creations and please try to add something for Plastic card it would be good as well. Beautiful card, Kerri! Love how you were so inspired by the photo with the jar of flowers as well as the colors!